The ARKA Acorn Urn is manufactured on the same principle as the Ecopod. It is hand worked, sanded and overlaid in a moss green or vibrant red softened 100% mulberry bark paper. 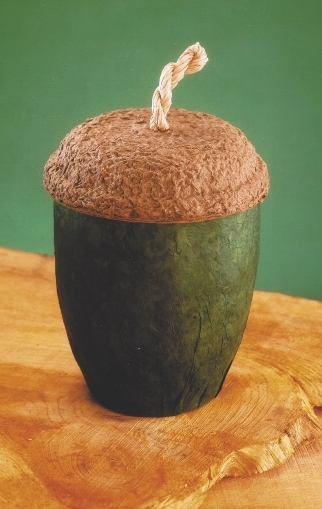 Produced to regulation size - 10" high x 8" wide - the Acorn Urn is overlaid in moss green or red hand made paper. The urn is intended to contain ashes after cremation. It can be buried and the natural biodegradable fiber will decompose several months in the ground. Plant the urn about 1-2 feet deep in the earth, at least 3 feet away from the roots of any small bushes or young trees. The alkali "ash" of the burned bones, mostly calcium phosphate and calcium carbonate (sterilized bonemeal) then returns slowly to the soil and will be used by the surrounding soil web, just as the ash from an old burnt out stump would be.